Sandra has published several paranormal novels: Butterfly Harvest, Dark Migration and The Dead Days Journal with more titles on the way. Her short stories have appeared in Suspense Magazine and various anthologies, with two horror shorts currently in production with Chilling Entertainment. Sandra is a member of the Horror Writers Association, Maryland Writers Association (M.W.A.) and the director of a M.W.A. critique group. Check out her website/blog at sandraRcampbell.com, or visit her Facebook page at Butterfly Harvest. 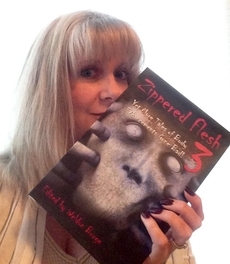 Sandra's story, "Gehenna Division, Case #609," was published in Zippered Flesh 3: Yet More Tales of Body Enhancements Gone Bad!